See more objects with the tag interior, decoration, furniture, home, domestic interiors, paper, ribbons, seating, curved, round, curving line, comfort, serpentine, rough, texture, layers, bent, unexpected shapes, recycling, rest, corrugated , extrude, cardboard, architect. See more objects with the color silver rosybrown darkslategrey dimgrey darkkhaki or see all the colors for this object. This is a Chaise longue. It was designed by Frank O. Gehry. It is dated ca. 1988 and we acquired it in 2012. Its medium is layered and bent corrugated cardboard. It is a part of the Product Design and Decorative Arts department. Best known for his deconstructivist buildings, Canadian-American architect and Pritzker-Prize winner Frank O. Gehry experimented with furniture design in the late 1960s before he became a household name. His first introduction to furniture-making was in 1954, designing furniture for enlisted soldiers while serving in the United States Army. Before becoming immersed in architecture, Gehry designed museum exhibitions, which allowed him to understand how three-dimensional objects inhabit a space. 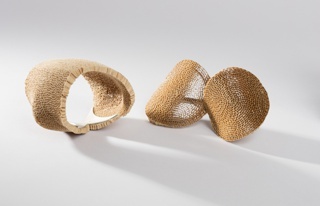 With the oil crisis of the 1970s and the growing awareness of the environmental effects of consumer waste, some designers looked beyond plastics for more eco-friendly materials. Gehry’s medium of choice for his furniture designs was corrugated cardboard; in particular, he employed the thick, sturdy kind that was used inside hollow core doors. His first furniture series, Easy Edges, was produced from 1969 to 1973 and consisted of inexpensive, mass-produced chairs and side tables in rectilinear shapes. This furniture line, considered the Volkswagen of furniture, was sold in department stores including Bloomingdale’s, and was intended to suit the needs of the young and old alike, as well as urban sophisticates and country dwellers. 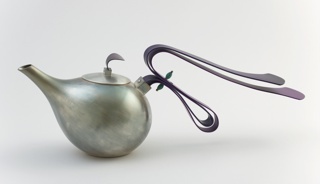 His second series, however, Experimental Edges, produced from 1979 to 1982, took a more modernist approach. 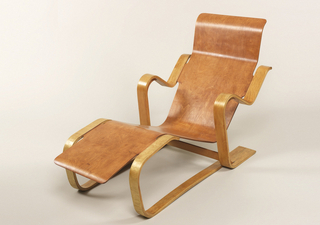 The highly structural pieces, which employed primarily curving lines, were handmade and sold through galleries as limited-edition art furniture, targeting a particular wealthy, high-end consumer. The Bubbles chaise longue (ca. 1988) embodies all of these features. It is number seven from an edition of 50, as noted in a plaque on the underside of the piece, and is constructed of corrugated cardboard with a fire-retardant coating. Its curved arabesque form is delineated by the lightweight cardboard. 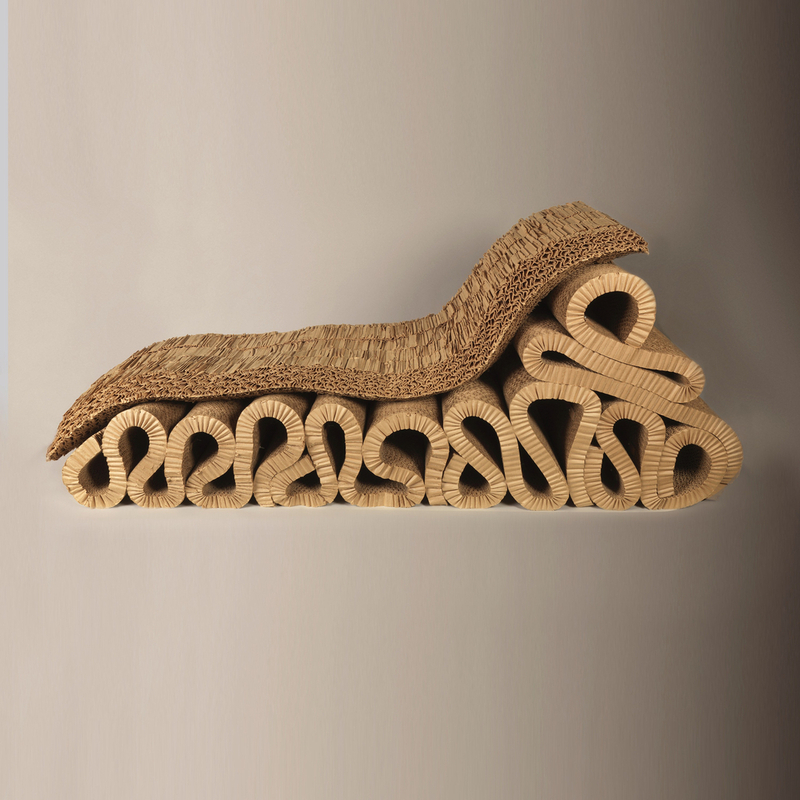 The cardboard base has been folded into s-curves, simulating a giant, continuous ribbon, over which is laid a rough-hewn layered cardboard cushion. In this manner, Gehry has taken a disposable material and turned it into a highly sculptural piece of art furniture, imbuing a seemingly worthless material with value. The chaise longue is a contemporary version of modern furniture innovations in bent wood, bent tubular steel, and molded plastic. The piece predates Gehry’s well-known monumental architectural structures, foreshadowing on a smaller scale and in a less extravagant material the sweeping, curving lines that have come to represent Gehry’s work, most notably the Guggenheim Museum in Bilbao, Spain. Gehry introduced a third furniture series in 1992, Bentwood Furniture, in which each piece is named after a different ice hockey term. 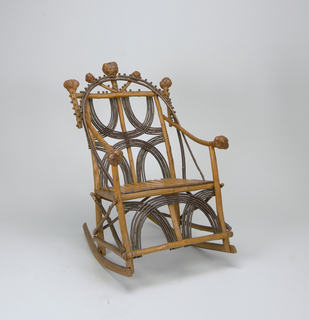 The Cross Check chair from this series is in the museum’s collection. The Bubbles chaise longue was a major exhibition showpiece featured in the museum’s 2008 exhibition, Rococo: The Continuing Curve, 1730–2008. It demonstrates Gehry’s range as a designer and presages his subsequent architectural style. 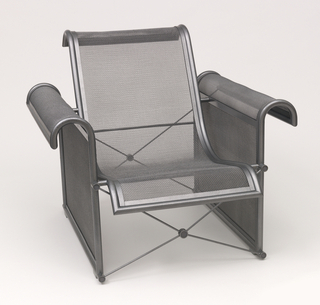 At the time of proposed acquisition, this piece would join three cardboard pieces from Gehry’s earlier line, Easy Edges, including a side chair, a lounge chair, and a stool. The Bubbles chaise longue tells the second part of Gehry’s furniture design story as part of the Experimental Edges group. This object was featured in our Object of the Day series in a post titled Cushy Cardboard. This object was purchased from Sotheby's. 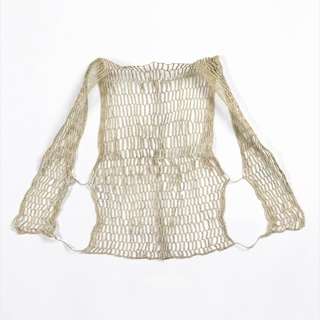 It is credited Museum purchase from the Members' Acquisitions Fund of Cooper-Hewitt, National Design Museum. silver-plated electroformed copper, anodized aluminum, onyx. Purchase in memory of Mildred Rosenberg, Gift of her Family..